This cup, with its flared mouth, the shallow curvature of its sides, and shallow ring foot, is decorated with two pairs of chickens and their young. The pictures show a rooster and a hen leading their young to feed, the hen pecking at the ground for worms, the young stretching out its wings. The illustration is full of life, despite its miniature size. The picture also has peonies, orchids and a lake rock, which serve to divide the composition into two groups. 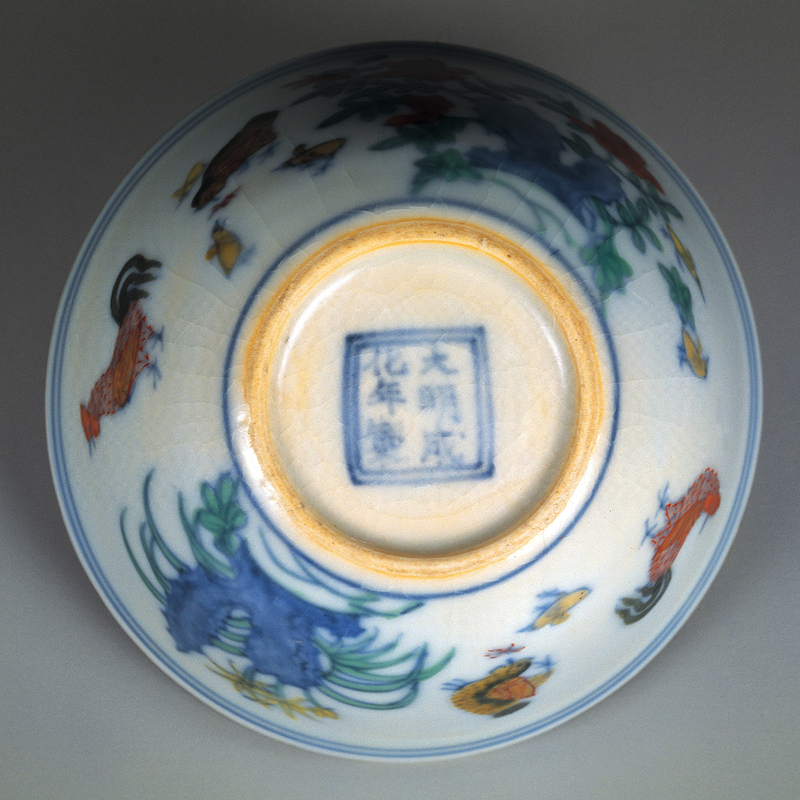 The inside of the cup is white and without decoration, and the six-character reign mark, reading “Made in the Ch’eng-hua Reign of the Great Ming”, is found on the base in blue on white glaze, surrounded by a double rectangular frame. These chicken cups were widely praised by the literati of the time, perhaps because of the emperor’s fondness for them, such that in the late Ming it was generally agreed that, “Ch’eng-hua chicken cups are the superlative drinking vessel.” It is also known that a Ch’eng-hua chicken cup, “worth 100,000 pieces of gold”, belonging to the Ming emperor Wan-li, went missing from his table.